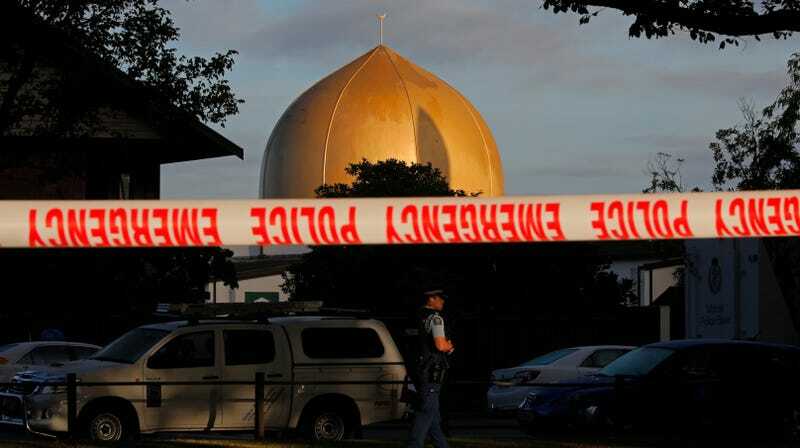 Police stand guard outside the Masjid Al Noor mosque in Christchurch, one of two mosques targeted by a white supremacist mass murderer this week, on March 17, 2019. Facebook said on Saturday night that within 24 hours of a horrific attack on Muslims in Christchurch, New Zealand that killed at least 50 people and wounded dozens of others on March 15, it had blocked 1.5 million attempts to share a video of the attack live-streamed on Facebook by the shooter. Over 1.2 million of those attempts were blocked at upload. At least 17 minutes of the attack were live-streamed on Facebook, and the mass murder was accompanied by the online release of a manifesto apparently intended to frame the incident within the context of fringe internet communities like far-right boards on the site 8chan. The suspect, named by authorities as Brenton Tarrant, referenced well-known internet figures like YouTube gaming personality Felix “PewDiePie” Kjellberg and conservative pundit Candace Owens in the manifesto, cited neo-Nazi terrorist Anders Breivik as the inspiration for the attack, and reportedly carried weapons displaying white supremacist symbols. As the Wall Street Journal wrote on Sunday, despite attempts to suppress its dissemination by New Zealand authorities and many major platforms, the video quickly spread on those same platforms, including Facebook, YouTube, and Twitter. The Washington Post noted that it remained easy to locate versions of the video on those sites as of Friday, and archived versions were just as widespread. TechCrunch also noted that the 1.2 million blocked-at-upload figure means that Facebook missed approximately 300,000 copies at the time they were put on the platform for distribution. It also fails to shed any light on how long the videos were on the site, or how many views they racked up. Reddit banned a community called r/watchpeopledie for violating policies that prohibit “content that incites or glorifies violence” in the wake of the shootings, with one source telling the Verge the users on the subreddit were actively encouraging sharing both the video and the manifesto. (However, the subreddit was largely inactive since 2012 and had been “quarantined” behind a landing page for some time, the Verge wrote.) Video game distribution platform Steam also took down over 100 profiles which had usernames or profile photos glorifying the Christchurch shooter. While Facebook has removed a staggering number of the videos, authorities are still angry with the platform over its role in disseminating violent imagery—and increasingly skeptical of it and other major tech companies’ go-to excuse that their scale makes it difficult, if not impossible, for them to react quickly to such events. New Zealand Prime Minister Jacinda Ardern has requested a meeting with Facebook over live-streaming, according to Reuters, while British Labour Party leader Jeremy Corbyn stated that “Those that control and own social media platforms should deal with it straight away and stop these things being broadcast.” Last year, European Union legislators mulled imposing fines on platforms that fail to remove extremist content within one hour, foreshadowing the kind of proposal that is likely to follow in the wake of the attack. Multiple organizations are asking for the public’s assistance to help survivors of the attack, as well as the families and loved ones of the victims. Please consider donating or volunteering to help.